NASA's Land, Atmosphere Near real-time Capability for EOS (LANCE)-Ozone Monitoring Instrument (OMI) provides certain OMI Level 2 (L2) and L3 products on a near real-time basis. On average, the Level 2 products are available within 3.5 hours of the observation time. The Ozone Monitoring Instrument (OMI) is a Dutch-Finnish instrument on board NASA’s Aura satellite, launched in July 2004. OMI is a wide swath, nadir viewing, near-UV and visible spectrograph that measures ozone columns and profiles, aerosols, clouds, surface ultraviolet (UV) irradiance, and the trace gases Nitrogen Dioxide (NO2), Sulfur Dioxide (SO2), and Formaldehyde (CH2O). The OMI NRT capability is a joint development of NASA and the Royal Netherlands Meteorological Institute (Koninklijk Nederlands Meteorologisch Instituut, or KNMI). 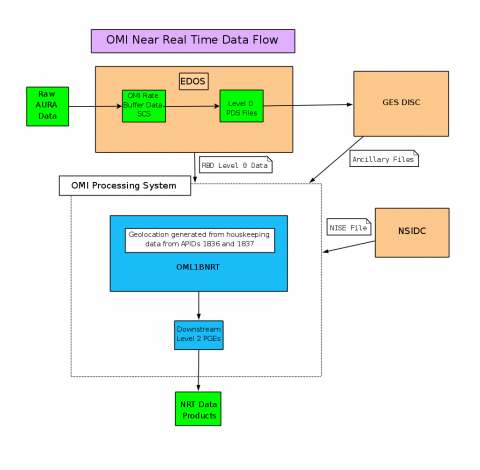 LANCE-OMI provides certain OMI L2 and L3 products on a near real-time basis. On average, the Level 2 products are available within 3.5 hours of the observation time. The products are available on either FTP server: omisips1.omisips.eosdis.nasa.gov or ominrt2.omisips.eosdis.nasa.gov and from the LANCE OMI Near Real-Time Products page on the Ozone and Air Quality website and from NASA's Worldview data visualization tool. The simple architecture used for LANCE-OMI is shown in the diagram above. The system includes 2TB of archive disk on the FTP server. The latter allows the archive of approximately 7 data days of NRT data products. The data flow is shown in the diagram above. The session based Level 0 (L0) data for OMI are ingested from NASA's EOS Data and Operations System (EDOS). These are pre-processed by OML1BRBD APP which removes duplicate packets, removes incorrectly time tagged data before processing by the L1B software. All EDOS data products are sent to the PDR server by EDOS and are ingested by LANCE-OMI.